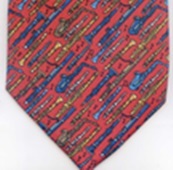 There are more Hunting Horn neckties on the Christmas Necktie page and the Fox Hunting section of the Horse Necktie pages. 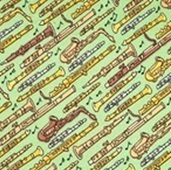 There is a page for Musician Neckties with bands like The Grateful Dead, Pink Floyd, Elton John and The Rolling Stones. There are also ties for performers like Elvis. Carlos Santana and by multitalented artist/musicians like Miles Davis. The Beatles have their own page with ties to celebrate many of their songs. There are also general ties showing musicians performing. Another page with Music Styles and Notation Ties shows ties with different styles of music, composers, music notations and sheet music designs.